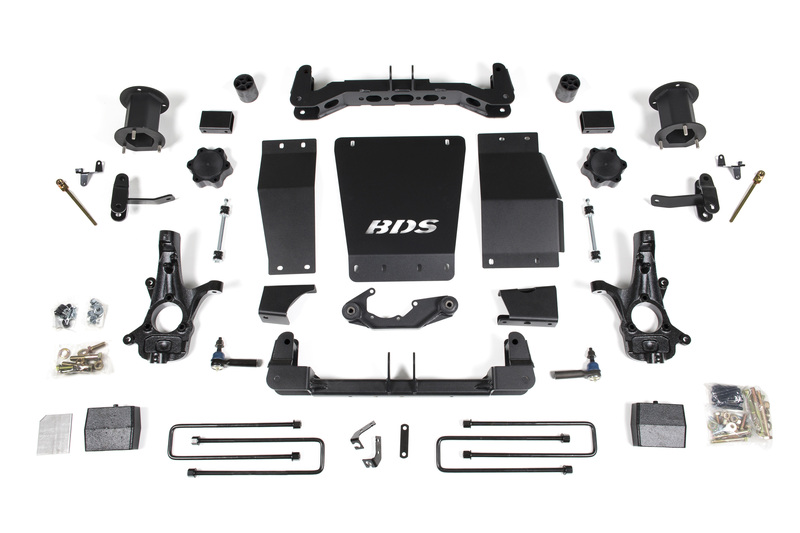 BDS Suspension has built a reputation for manufacturing top quality, high clearance suspension systems for Chevy and GMC 1/2-ton trucks. 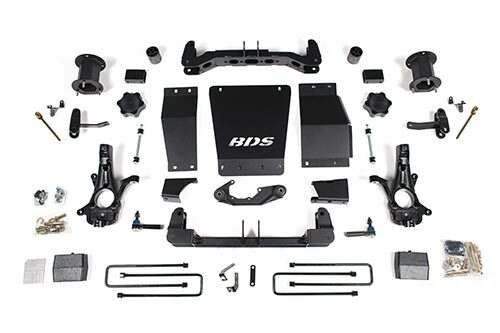 Designed for smooth on-road ride quality and improved offroad performance, BDS systems continue to be the "go to" choice among many 4x4 shops and truck builders. The newest kits to hit the market cater specifically to the 2014-2016 GMC Denali 1500 owners with the factory installed Magneride system. BDS now offer 6" lift kits to retain full functionality of the Magneride system for adaptive performance to whatever terrain you find yourself in with clearance for 35" tires. As with all BDS lift kits, these new Magneride compatible kits are backed by Factory Protection Plus for piece of mind wherever your adventures may take you. Factory Protection Plus includes BDS’s exclusive No Fine Print Warranty, FMVSS No.126 ESC System compatibility and a 5-year, 60,000-mile drivetrain warranty. More kit info below. 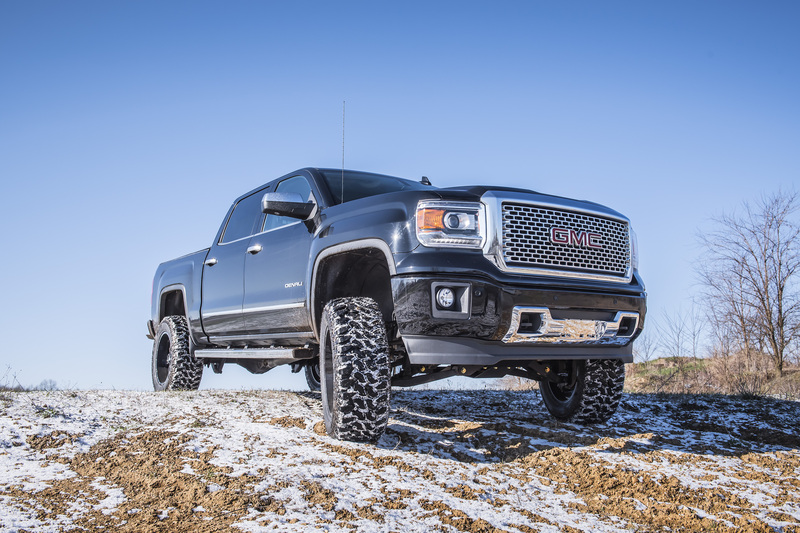 6" Lift Systems for GMC 1500 w/ Magneride: BDS Suspension now offers 6" Lift Systems for the 2014-2016 GMC Denali 1500 trucks with factory installed Magneride magnetic ride control system. 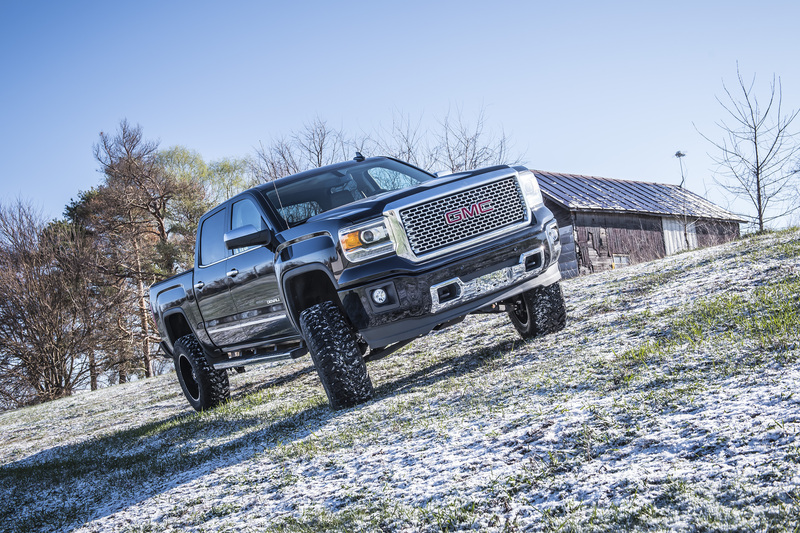 These new suspension systems utilize the tried and true high-clearance IFS design that has made BDS the preferred suspension lift for late model GM trucks. At the core of these new lift systems BDS supplies a pair of 1/4" thick laser cut high clearance crossmembers and differential skid plate to reposition the lower arms and add protection. These combined with the CNC machined ductile iron replacement steering knuckles creates a stout subframe to correct suspension and steering geometry for ESC system compatibility. Up front the kits use a multipoint differential relocation kit and CV spacers to securely reposition the front differential to correct CV axle angle and allow use of the stock front driveshaft. Top mounted strut spacers are used to retain the Magneride struts as well as new sensor brackets to properly reposition the Magneride sensor arms. Also included for the front are replacement tie rod ends, longer sway bar links, brake line brackets and a BDS front skid plate. In the rear BDS uses 5" cast iron lift blocks and longer u-bolts in place of the factory block kit to net 4" of lift for a level stance. Rear shock relocation brackets are used at the axle mount to retain full functionality of the Magneride rear monotube shocks. The kits come finished in a durable textured black powdercoat, all hardware is provided along with step-by-step installation instructions. Improve the look and performance of your late model GMC Denali 1500 with room for up to 35" tires with this new lift system from BDS Suspension. While they’re both suspension related, its somewhat of an apples to oranges comparison. Both offer a smooth ride on road and adaptive dampening based on the terrain, but in high-speed rough terrain the larger shock body and external remote reservoir of the FOX 2.5 coilover will allow for better dampening and fade free performance. The MagneRide system is a OEM installed option, not something we offer. If you purchase a GMC truck with MagneRide this is the kit you’ll need, if you purchase a truck without MagneRide we offer the standard IFS systems and FOX 2.5″ performance coilover system options. Hi I have a 2017 gmc Denali 1500 4wd with MagneRide. From reading your last post you sent to Eric, I’m under the impression I can’t upgrade to Fox 2.5 coilover system because I have magneride?? If this is not true let me know cause I really want coilovers. Hey Kevin, if you’re set on running coilovers you’ll need to purchase a standard GMC Sierra (w/o Magneride) and trim it out like a Denali. The Magneride system is tied into the ABS and stability control system and cannot be deactivated. Wow, i have a denali, so there so no way we can switch to a coilover kit? No way around? Like a mentioned in the previous comments the Magneride system is tied into several offer systems on these trucks (ABS and ESC) and GM doesn’t allow it to be disabled so while the Magneride struts/shocks can physically be removed and replaced with FOX coilovers and struts, the truck won’t be driveable if you do so. If you don’t want Magneride then you’ll want to stay away from the Denali and go for an optioned out GMC Sierra 1500. I have a 2015 Chevy Suburban LTZ with Maneride suspension and have been looking for a way to lift the truck. This may be my only hope. Is BDS planning or already have a way to put a 6” kit on a Suburban with Magneride ? Please tell me there is s way to do this. Hey Johnathan, at this point we have not released any kits compatible for Magneride-equipped Chevy/GMC 1500 SUVs, only the trucks currently. Unfortunately (per company policy) I can’t get into new product development topics until parts are on the shelf ready to ship, all I can say is that at this time we don’t offer Magneride SUV kits. So sad. It’s been so frustrating trying to find a kit for my truck. Magneride has been a huge pain when it comes to lifting a truck. Is bds planning on making a 4″ lift for magneride. Hey Aaron, we have additional kits in the works for the Magneride-equipped trucks, however due to company policy I can’t get into new product development details, pricing, or expected release dates. As kits hit the shelves ready to ship we’ll be adding them to our website and sending out new product announcements. I have a 2014 GMC Sierra will stock rims work after a 6” lift installed? Hey Bill, that all depends on your factory wheel diameter. Due to the repositioned steering arm mount on the new knuckles to keep our kits FMVSS No126 compliant (ESC System compatibility) the factory 17-18″ wheels cannot be reinstalled due to a tie rod clearance issue. Factory 20″+ wheels can be reinstalled. Hi, I know this kit is meant for 2014-2016 GMC trucks with Magenride, is this compatible for the 2017 Sierra Denali with Magneride? Im not seeing another kit for the 2017. Appreciate the response. Hi Steven, thanks for your interest in BDS Suspension. These particular kits will not fit your Yukon Denali as these kits are for the leaf spring rear trucks rather than the linked rear SUVs. At this point we’ve released SUV kits for the late model standard coil rear Tahoe/Yukon as well as the AutoRide equipped models, the Magneride equipped Yukon Denali kits are still in development. Company policy I can’t get into new product development topics or expected release dates, once kits are on the shelf ready for shipping we’ll be sending out an announcement and adding them to our website. do you guys offer a system with rear spring instead of 5″ blocks? or maybe an additional kits to prevent axle wrap with the added leverage on the stock leaves that is created by the blocks? Hi Nathan, while we do offer rear leaf springs for the GM1500 trucks, they are not compatible with the Magneride equipped trucks. To maintain proper rear Magneride sensor positioning the factory spring must be used. While axle wrap isn’t excessive with the 5″ replacement block setup, we do offer rear traction bar kits #121619 that wil lwork with these lift systems. Hey Adam, regearing the axles isn’t a requirement when installing the lift and larger tires. That said it will help with overall performance, but the average consumer doesn’t. By not regearing when you install the larger tires you’ll notice some minor effect on acceleration, fuel economy and shift points. Have you released the 2017 GMC Yukon Denali with magneride 6”lift kit yet? Still waiting on that 2015 Chevy Suburban magnaride lift kit. Reading through the comments is depressing since it is 2019 and no additional kits have been marketed. I understand you may not do them. I would love a 4″ Magneride lift for a 2018 Sierra Denali. I would buy one immediately if you offered it. Hoping for a 2015 yukon xl denali magneride kit. ANY news on a lift kit for a GMC Yukon Denali with Magneride? I’ve been looking since 2016. I have had your lift kit on a previous truck and LOVED it! I know other brands make kits that work on the SUV’s equipped with Magneride, but I would like to stick with BDS since I have confidence in your brand. I’m looking for an 8” kit for a 2018 Yukon Denali XL. Please advise. I really can’t wait any longer. Email me directly if we can get parts put together to make it work that you aren’t currently offering in a kit. Thanks in advance. Hey Jack, nothing to report at this point on lift kits for the Magneride-equipped SUVs. Engineering is constantly working on dozens of product development projects at different stages of the design, testing, certification, and manufacturing process. As a company we make a point to not discuss/promote products before they hit the shelves ready for sale. I know that’s not the answer you want, but I will go as far as to say we don’t have an 8″ magneride SUV kit in the works currently, other kit sizes are likely in the future though.